Remi wrapped his arm around my shoulder, we picked up the pace and shuddered in unison. That Mistral wind! Always arriving precisely when it is most unwelcome. So it was on a Sunday morning in December. But the sun was gorgeous as it always is on such windswept days and for once, I had prepared, wrapping myself in layers of cashmere with gloves and a bonnet in my pocket plus fly-sized glasses to keep my eyes from tearing. I had to keep my focus. For yet again, we were on the hunt. 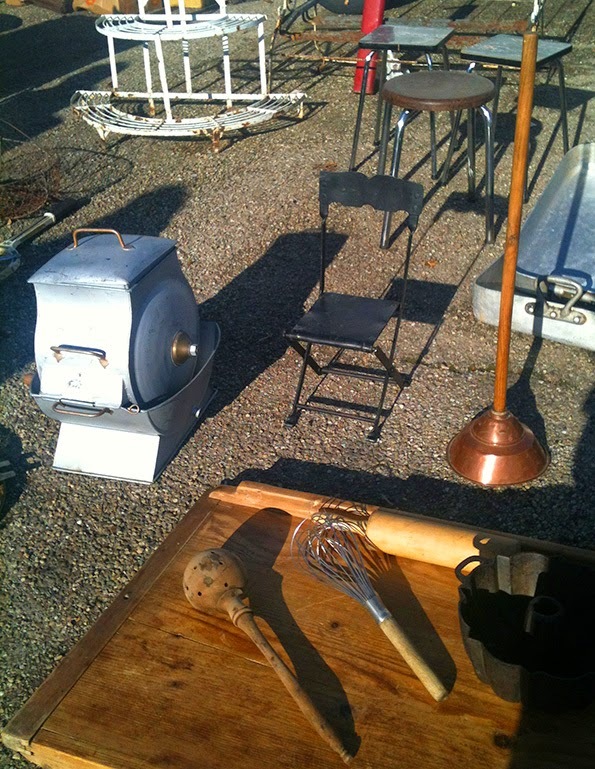 Of course, we didn't actually need a thing from the brocante or flea-market at St. Etienne du Grès. But it has always been about the Art of Looking for us. The prick of possibility. From those very first weeks together in Vanves on the outskirts of Paris, we would walk the puces every weekend, sometimes on both Saturday and Sunday. It was our antiques education, not to mention free entertainment. We didn't yet have a spare dime between us, so despite our empty apartment (I had only brought an Icart print and many pairs of heels with me from NYC), we simply asked questions of the dealers and compared likes and dislikes over a scrambled brunch upon returning home. The Mistral whipped Remi and I off into our own individual orbits. Which was just fine as we were both too busy storing up little bits of lost history and found inspiration to be good company. Pushed forward by the wind, I rolled through aisle after aisle, past the sellers lunching on saucisson and warming wine, while mentally sifting the junk from the jewels at each stand. And somehow, just that walking while looking outwards with a soft gaze, always tends to do the same for me mentally. Stuck staring, I wondered with my head tilted just so and responded to each dealer's enquiring eyes with a nod that was curt but kind. "No, sorry but no." 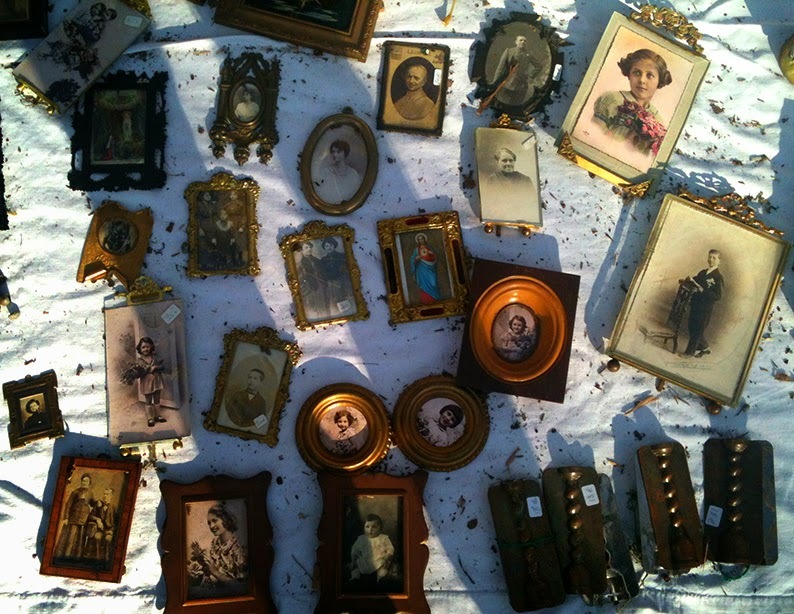 As always, I was searching without really knowing what I was looking for and perhaps that is another reason why such flea market strolls are so comforting. Anonymous, right in the thick of the crowds, we all are. I finished first as I often do, impatient red-head that I am. But then again, it just might be that I like that moment of turning back to search for Remi's face, that familiar face, to catch him unaware with weighty eyes. Slowly, I reeled myself in towards him until that arm was replaced wordlessly, shoulder-round. 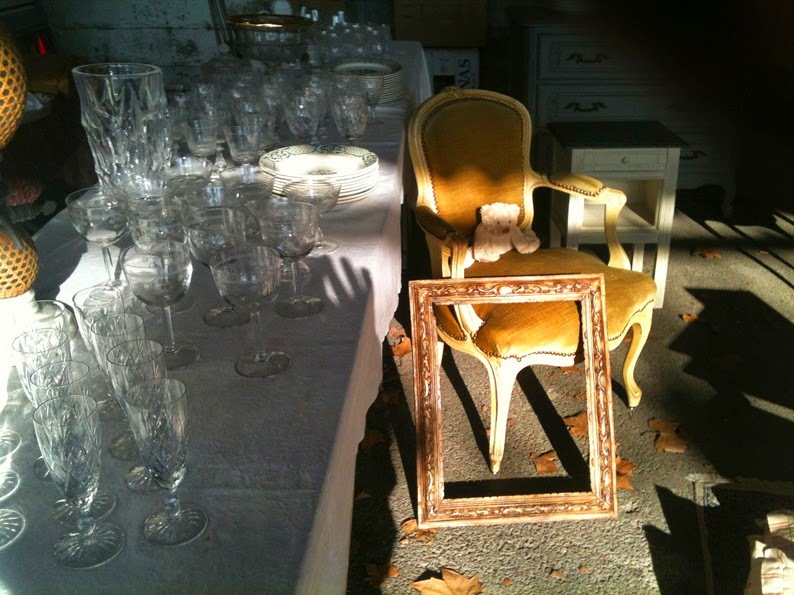 We didn't end up buying anything as we knew we probably wouldn't and turned to leave as the dealers started to close up shop - repacking their wares carefully and with a hint of accustomed disappointment - all of us waiting for a "Yes, thank you, I'll take it," possibly at the next brocante. What do we think? 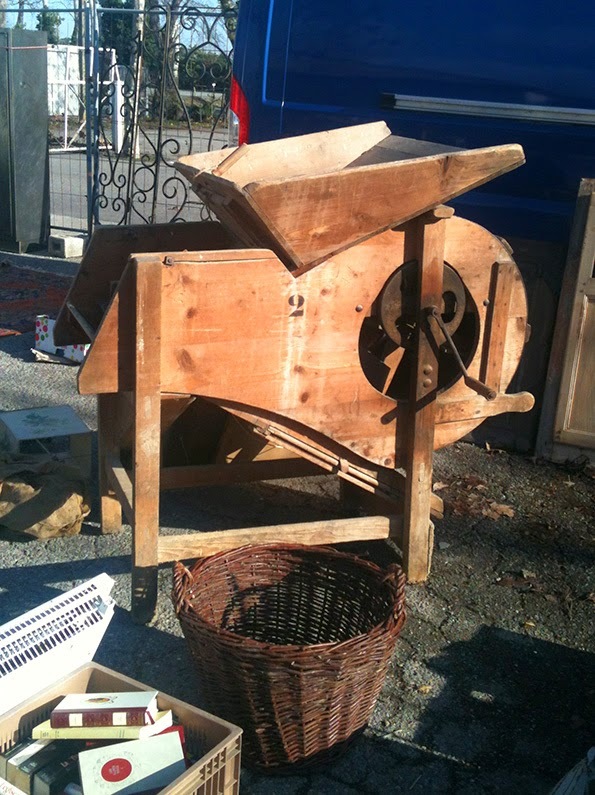 An olive or grape press? Did you see anything that tempted you? 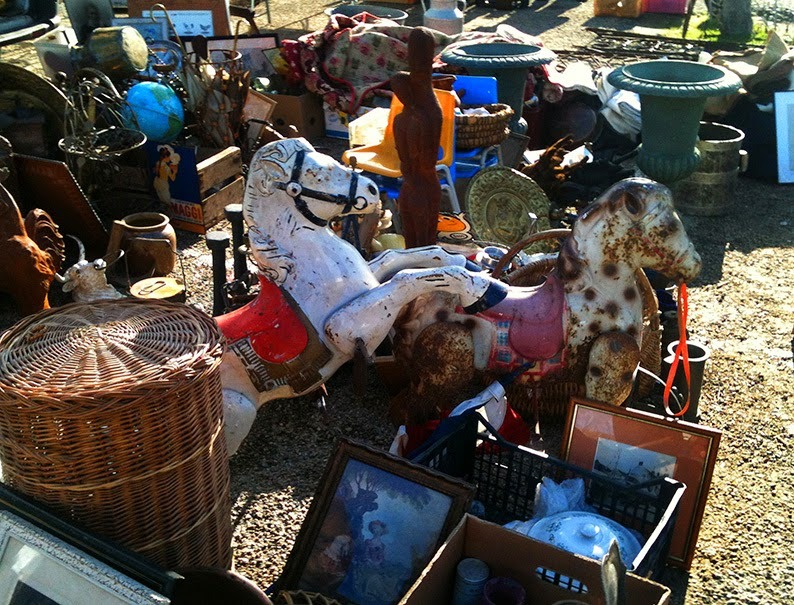 I feel like a brocante addict desperate for a good flea market shopping high! Shopping with you is the next best thing. Oooh - I like the pictures! And the teddy bear in the chair. And why not a rusty pony? (except that it would probably scare Ben and Kipling). 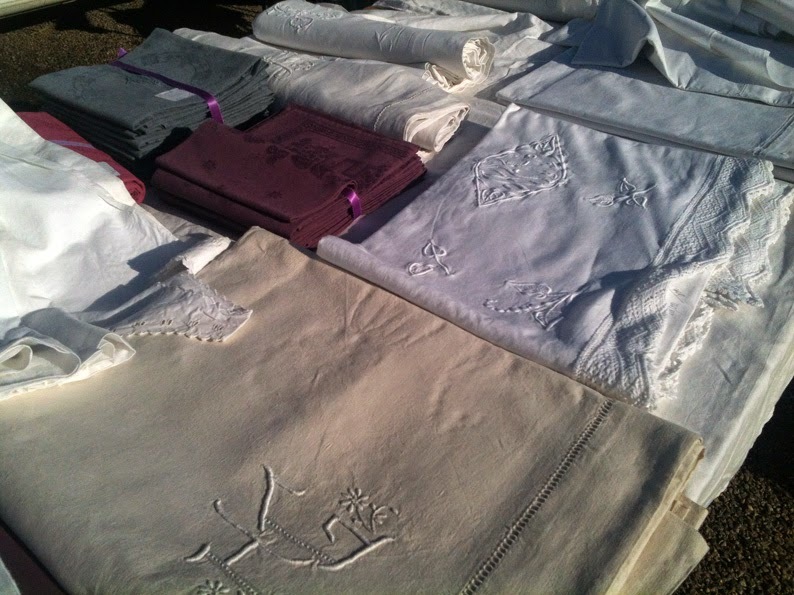 Yes, a few items told me we were in France - the the grape/olive press and the linens - so fancy! This also made me think about the discovery that our old house is now a bed and breakfast, and the pictures of all of the antiques in it! 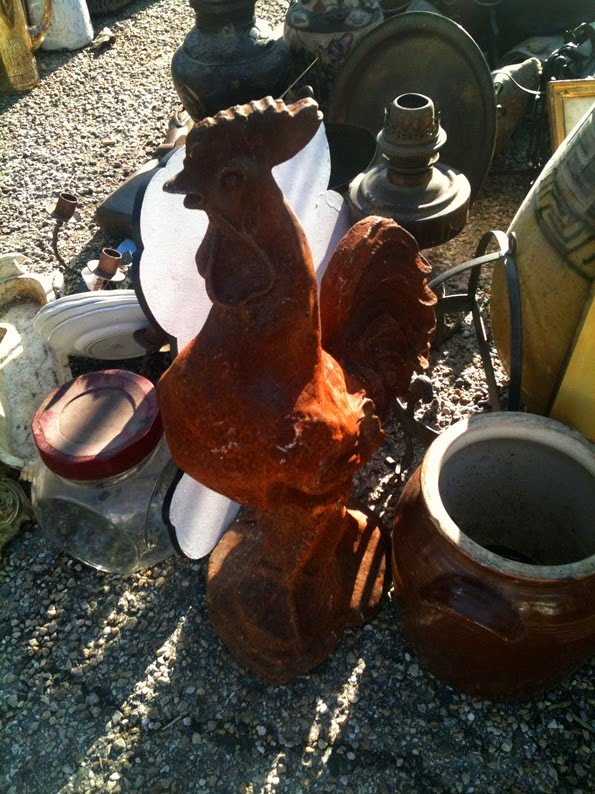 We also grew up around antiques, so that's maybe why your are drawn to them. It does look wintery there, but it sounds like a lovely afternoon with your sweetie - thank you for sharing it with us! Heather .. Lucky Woman .. just to be there, with the possibilty of hauling some newfound treasure home .. in France .. in La Mistral .. Lucky Woman! Ahhhh, consider yourself very very fortunate on that account. :) And we are lucky it is true! 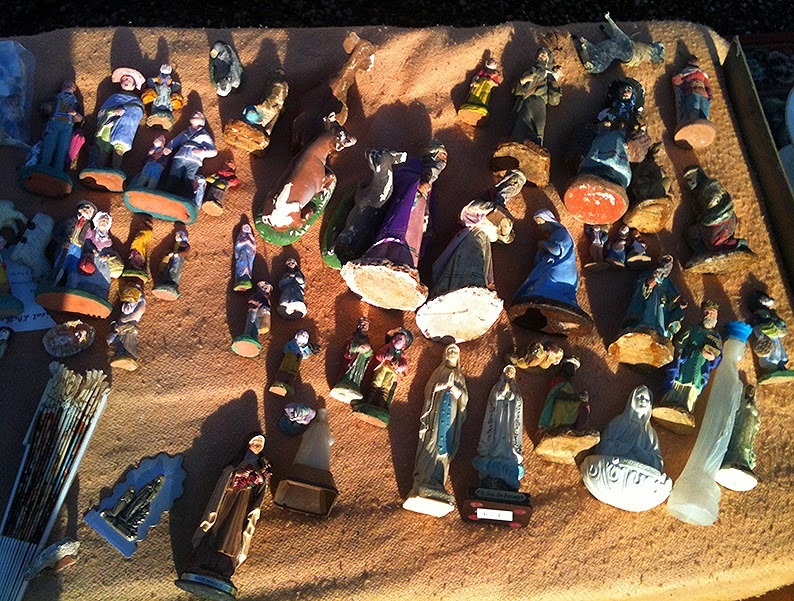 If you get super starved you can always come to Provence as there are brocantes pretty much year 'round! I'm actually intrigued by the tri-fold mirror in the first photo. The ponies are interesting, but one would need a bigger house than mine for them. 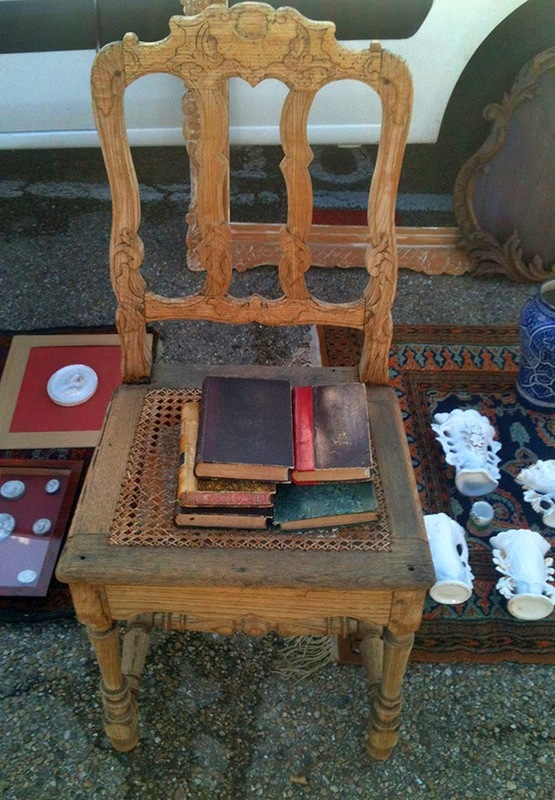 The embroidered linens are wonderful, the faded shutters...the chair with some old book titles. But then again, I have just been going through a clutter clearing purge since Christmas and am intending moving through the house into other rooms. I feel so very virtuous and FREE after doing it. 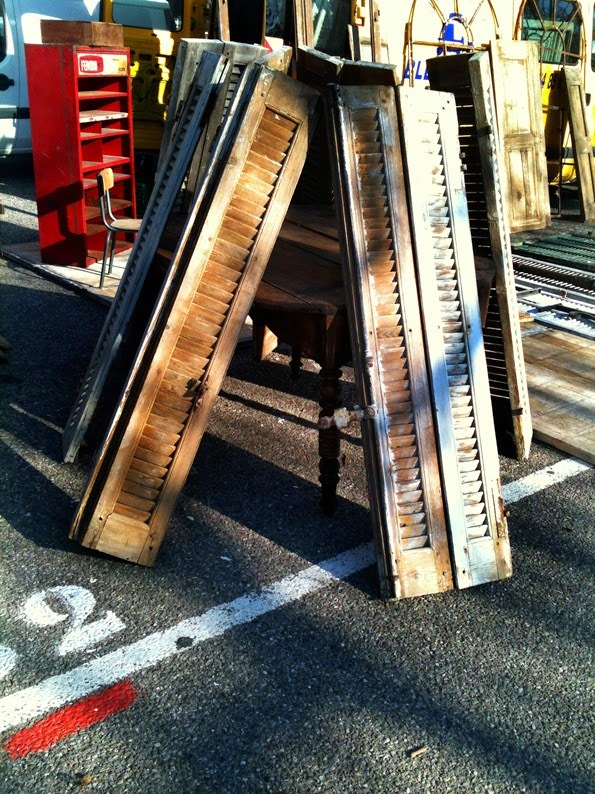 (Using La Contessa'a capitalisation) that I might turn around after the flea market visit and be satisfied with just the looking too! Yes, that is it exactly! We won't bring anything in unless we know exactly where it could go since we like the house as it is (and already have too much "art" that isn't even out). That is awesome that you are decluttering. We had to since we moved (aka downsized) twice in recent years - even though there is still more to get rid of, always. And isn't that mirror amazing??? The piles of linens caught my eye. They are beautiful and so popular now that I wonder how there can be any of them left. I'm not much of a shopper, but looking at all these items I would wonder about the stories each one could tell. A great way to spend free time together. Quite simply, those linens aren't cheap! 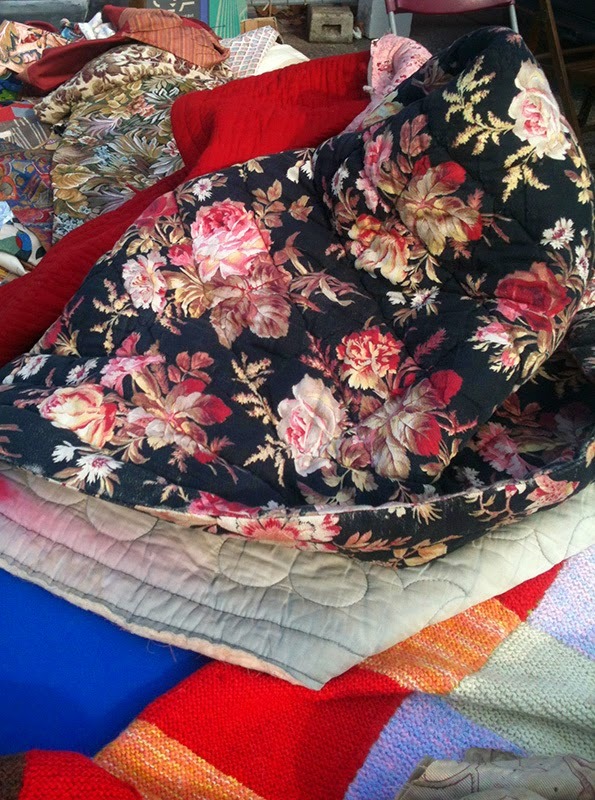 :o We have bought a few over the years though when we have been able and they really are wonderful - they keep you warm in the winter and cool in the summer. "They don't make things like they used to..."
I bought my boutis a looong time ago so I don't know how much they are going for these days - although I do know that the prices vary widely depending on the condition. That one was very you! Gosh, such willpower! 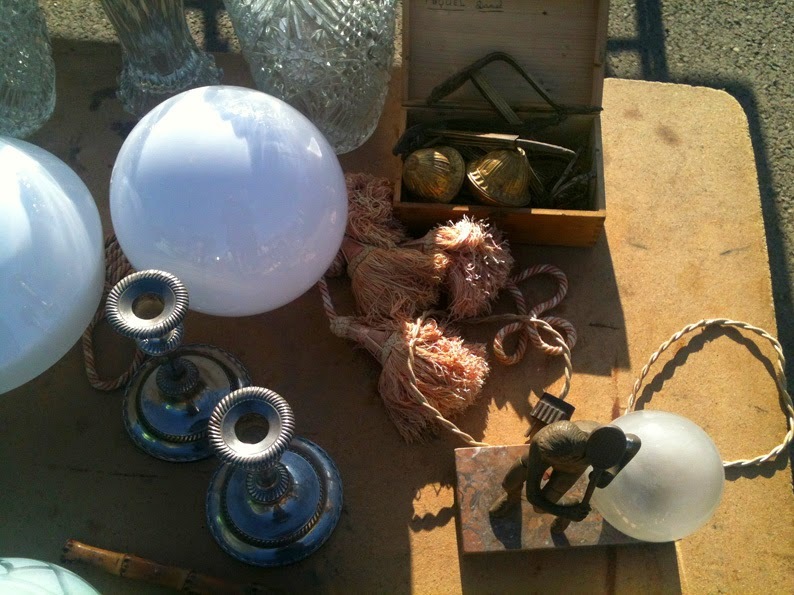 We should not have been able to resist a little something from these eclectic treasures. Your photographs are quite haunting. 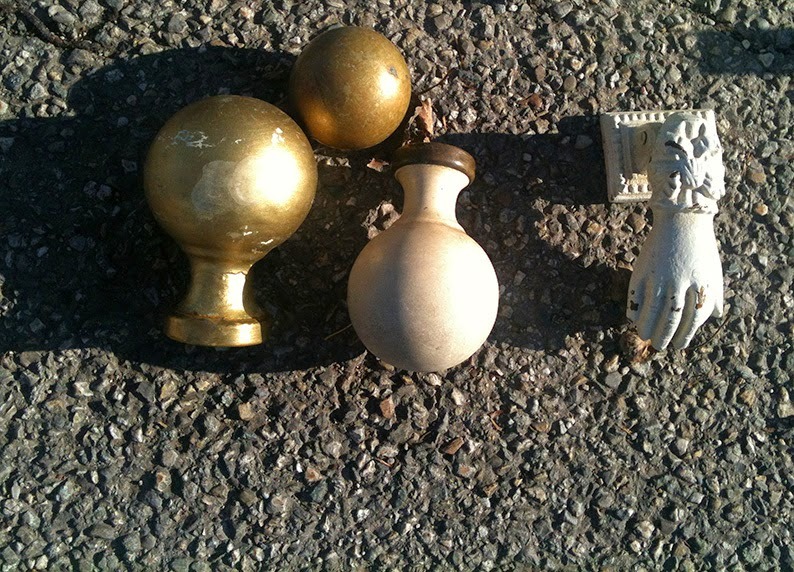 As one scrolls through one cannot help but have the mind wander to the provenance of these items. What memories and tiny scraps of history they hold. What stories they could tell if only they could speak. And yes, we do have willpower! 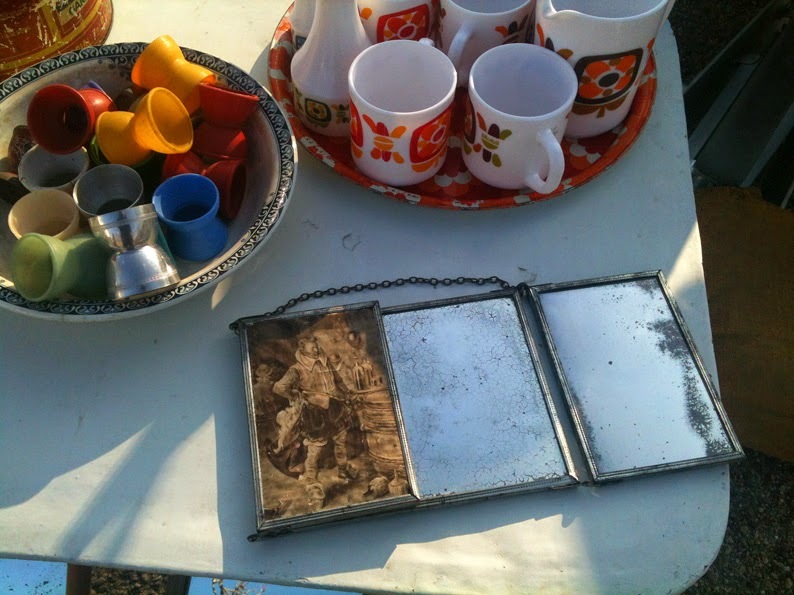 But we have gone to so many brocantes over the years and hope to go to many more. I'll take some of the linens and the teddy bear please. One of my absolute favourite things to do on vacation - made even better by the fact that we now own a house in France just asking to be filled with lovelies from the brocantes! So far the house hasn't been finished enough to fill with stuff but on our next trip in March we are planning a brocante blitz ! Thanks for a moment of vicarious travel this dull Wednesday morning! Oh you are welcome! And how fabulous to be at the point where you actually NEED to buy things for your house...ah, I miss those days. :) If you are here in Provence, let me know and I will hook you up with good addresses! I really love those three paintings!! I hope you have a super duper Wednesday, Heather! Oh, I would have definitely gone for the wine glasses. So many of the same type. In fact I am waiting now for quite a while to buy new glasses since I really want to buy them when we are in I-S-L-S end of April. We are exactly the same with our wine glasses. Ben and Kipling are the Champions of knocking over glasses on coffee tables with wagging tales! Eh oui and you know that you will find what you need at L'Isle...but the question is...will you be able to afford it? Cool, thank you for the LInks! But I really have to come and taste before. What Wonderful and suggestive objects! They make me feel better! I would like to have such a stroll here! Lucky woman ! Here is my List: all the linens, all the glasses, the iron tables, the books and the chair, the clock and finally "les paniers en fer". 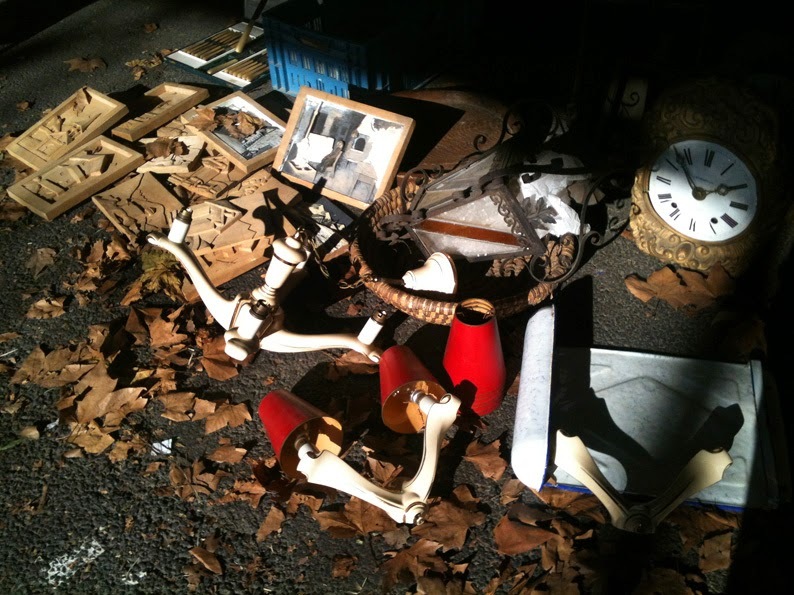 When I visit puces I don't know what I am looking for just like you but you are right when you say that such flea market strolls are so comforting. It is a sort of full immersion into the past and beauty! Emilia, that made me smile. That is quite a shopping list that you have there!!! But I know that it would all look perfect in your lovely abode. I'll take that chair in the last photo, please. I'm a sucker for the stray chair... And the frame leaning against it. I would hang it on the bare wall I'm staring at right now, either empty - a work of art on its own - or with a quickly created watercolor abstract. 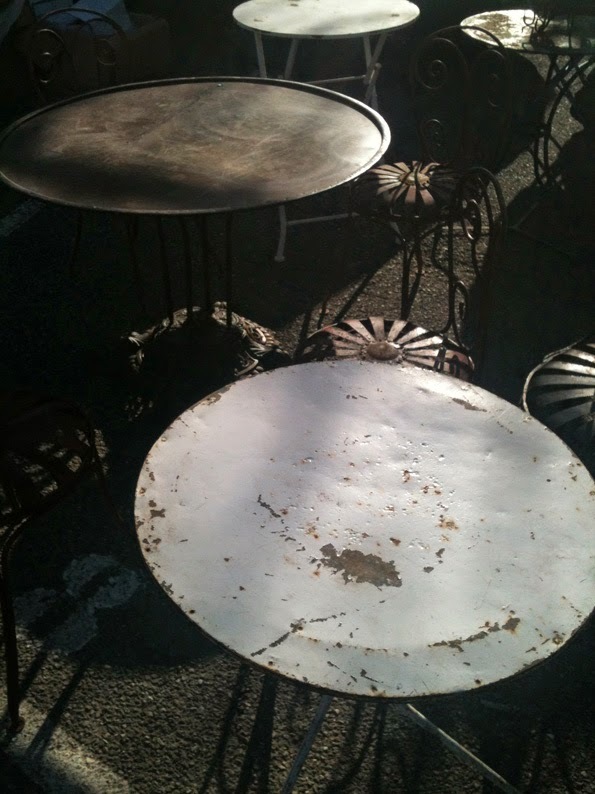 I love linen...and I would adore a vintage French cutting board...one that has age and patina. We have nothing like this where I live...so I am going to live vicariously through your images and posts! You are killing me as well. Oh to have such a market near us in Greece! The closest seems to be in Athens, too far for a Sunday morning outing. . .but then there were rumors of a place in Tripoli. . .one of these days I hope to have a similar post from down south of you. I did laugh at your Mistral wind. . .we experienced it for the first time this last month and have a whole new understanding of dressing in layers from head to toe. And this die-hard contact lens wearer finally gave up and put on the glasses . . .which also helped block the wind from searing through my eyeballs! Ai! Be careful with your eyes!! What is the name that they have for the wind?? I bet that there are several! Or the way you weave a compliment? ;) Merci, Jennifer and it is interesting that you and Brooke said the same thing...Someone in Cali needs to bring all of this stuff over there! Its all tempting! Biggest eyes on the globe in the background. Hi Heather, thanks for the birthday wishes. Yes we are close in age :) And thanks for the compliment. I did pass my test so life is more or less back to normal now. 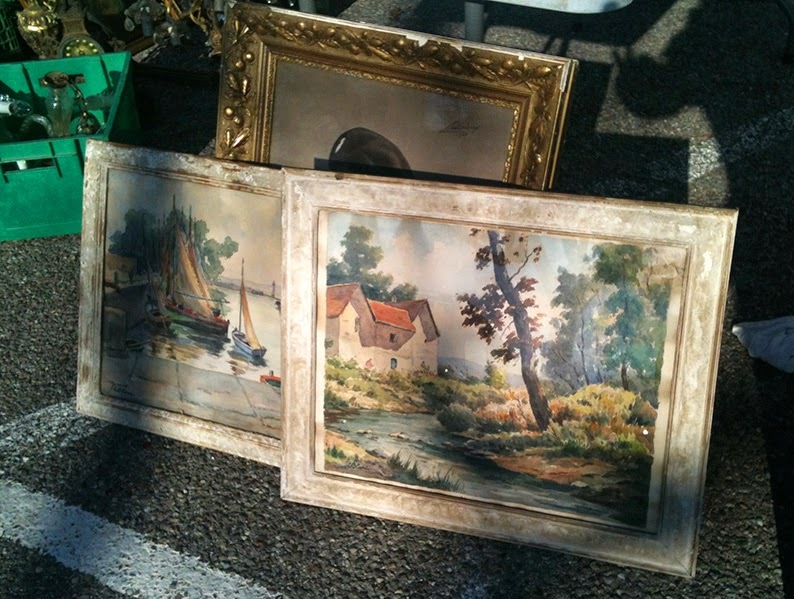 I love it when you go to flea markets and share with us. 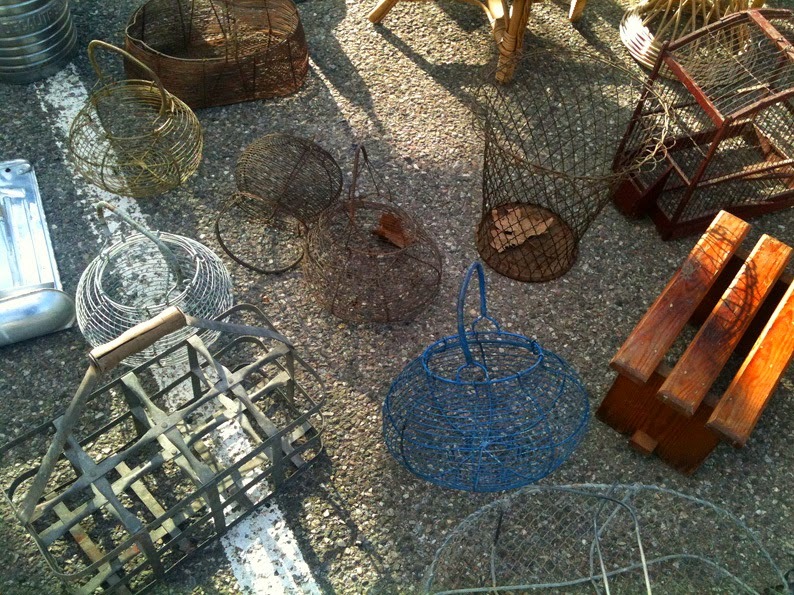 I would have bought some wire baskets, that wooden chair and the linens. A day of relaxation: walk, browse, and learn. Or discover. I’m surprised by the presence religious statues. Thank you for the blog. I do a little one of my own, just to keep friends in the US up to date, I know how much work it can be. Hello and bienvenue! And thank you for the info - I would never have guessed that it could be for grain sorting but that makes perfect sense. I would have just asked the seller but he had quite a scowl on his face so I didn't dare!